During Fitness Month at Mobile Nations, we put the majority of our focus on fitness and caloric tracking. Jared did mention how he uses his BlackBerry to eat better. One of the biggest stigmas is that dieting restricts your food selection; this couldn’t be further from the truth. I can confess that I used to think like that and would have an incredibly difficult time trying to come up with a meal plan every week. We would end up having the same meals each day of the week, every week. With that mindset, no wonder the urge to cheat on your diet is so high. The truth is that there are so many delicious and nutritious recipes out there. 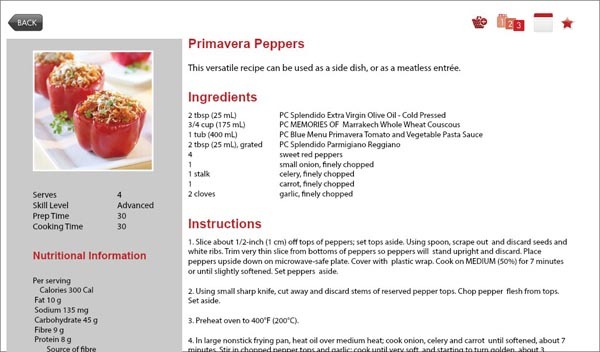 If you have a BlackBerry PlayBook, you can find many recipes with the Recipe Box application. 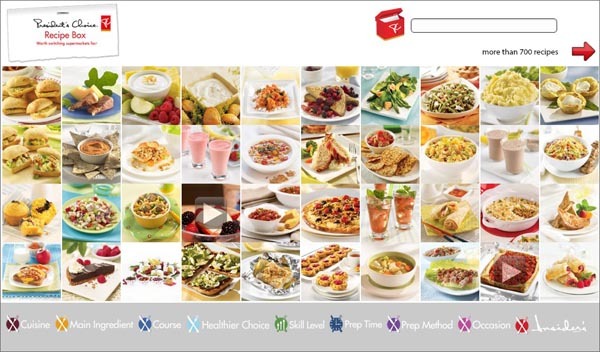 With over 700 recipes to search through, you’re sure to find a huge selection of meals to enjoy, while making sure you’re not adding inches to your waistline. Keep in mind that Recipe Box is only available in Canada. Now keep in mind that this app is President’s Choice brand focused, so you could make substitutions if you’d like. It’s not necessarily about what brand you buy, it’s about having a savoury reward after a hard day of working out. The app opens up with a delectable display of meals that you can tap on while you drool. Alternatively, you can tap on the search options listed at the bottom of the screen; options include Cuisine, Healthier Choice, Prep Time and Occasion. There’s also a keyword search option, as well. Swiping down from the top bezel gives you additional options, such as; checking your favourite recipes, watching how-to videos, reviewing notes you may have made and access your shopping list. For our purposes, we should open up the Healthier Choices tab at the bottom. We don’t want to stray from the plan, right? So when you tap on Healthier Choices, a pop up asks you which type of recipe you want to work with: Higher Fibre, Lower Calories, Lower Fat, Lower Sodium, Omega 3, Soy or Vegetarian. Based on that, you are presented with more images of mouth watering meals you can swipe through. There’s no way of zooming in on the images for a closer, more tantalizing look. In case you couldn’t tell, I like food. If you are finished salivating all over the screen, select a recipe to reveal its details. 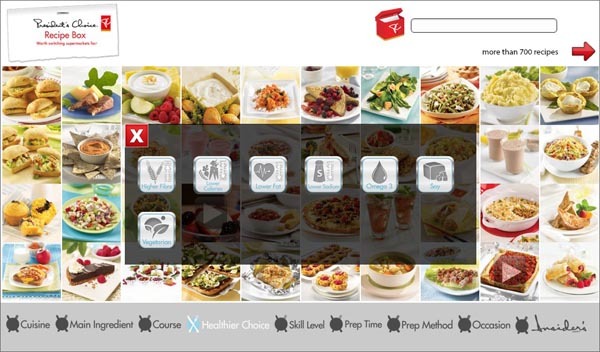 The recipe card will give you nutritional information, prep/cooking time, ingredients and instructions. The default view has you scrolling up and down. At the top right, are four icons allowing you to add the ingredients to a shopping list, change the instructions to a page by page view, add notes, or mark the recipe as a favourite. 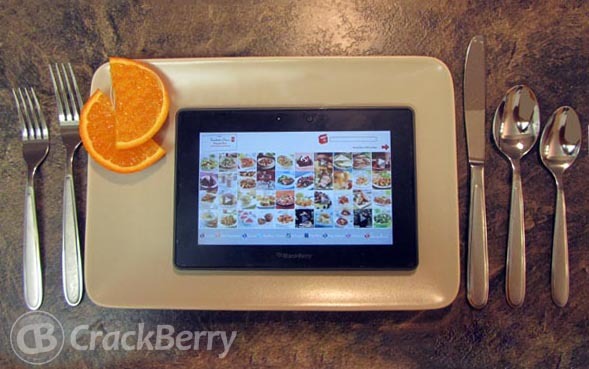 When it’s time to hit the grocery store, you can take your PlayBook with you. As you load up your cart from the grocery list on Recipe Box, you can check off each item. Again, it’s President’s Choice based, so you can choose alternatives, if it suits you. Seriously, would you work out even harder, and not be tempted, if you had access to recipes this tasty? The instructions are straight forward enough for anyone to follow, even me. Luckily, each recipe also indicates the skill level so you know which ones you can tackle and which ones you can let someone else create. Regardless if you are looking for healthy meals or not, a smooth recipe application is where it’s at. Like clipping out meal ideas from a magazine, the favourite feature keeps your must haves close at hand. There doesn’t seem to be a way of searching for more recipes outside of the application. Unless it gets updated, I suppose you have to try out every single one of the over 700 recipes. It also isn't available outside of Canada.